Battle of the Animals is a lavish, action-packed, and vibrant Renaissance tapestry that was made in Flanders during the 1580s. The foreground teems with exotic animals, both real and fantastic. At the lower left, an ocelot stalks his prey; at the center, a large red hunting dog wearing a jeweled collar snatches a water fowl from a stream. An ostrich surrounded by a variety of reptilian creatures pecks at flora on the stream bank; a unicorn stands nearby. In the background, hunters and soldiers with their dogs race through the wooded landscape. Some are hunting wild game; others seem to be chasing each other. A rabbit, perhaps symbolizing fertility, sits in the crook of the tree at the center mid-ground. A castle and farmstead are seen in the distance. Even though usually related by theme, the borders of tapestries were often designed separately from the center portion. In both the left and right lower corners of this border, Diana, the goddess of the hunt, is shown with her dog. The remaining areas are filled with Renaissance ornament, grotesques, satyrs, and animal-headed musicians. For its wealthy Renaissance owner, Battle of the Animals served as decoration as well as indoor theater. 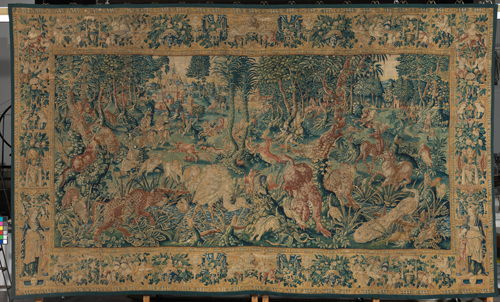 Scenes of animal combat would have been familiar to the tapestry's audiences, which would have seen them as both allegory and representative of live entertainment at court. The educated classes of Renaissance society would have known the more exotic species through illustrations and the private zoos, or "game parks," of the highest nobility. The conservation treatment of Battle of the Animals was made possible in part by the Institute of Museum and Library Sciences.